Amongst the most fashionable colours of the day, is the apricot pastel colouring. 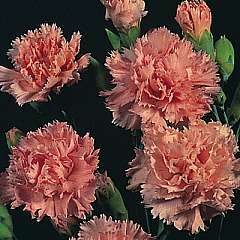 Here in Peach Delight, it is produced for the first time in the Carnation, therefore combining a very popular colour with a very popular flower. Easy to raise and fully winter hardy, producing straight, sturdy stems which normally need no support. Flowers mid summer. Height 2-3ft. Sow from late winter to early summer in John Innes Seed Compost, just covering the seed with compost. Make sure that the compost is moist but not wet and seal in a polythene bag until after germination which usually takes 7-14 days at 15C (60F). Transplant when large enough to handle into 8cm (3in) pots and grow on in cooler conditions. Gradually acclimatise to outdoor conditions for 10-15 days before planting out after all risk of frost 38-45cm (15-18in) apart. Prefers a sunny spot on light well drained soil. The spicy clove flavoured flowers add a zest to salads and can be candied, made into jam or sweet-sour pickle!. Copyright © Thompson & Morgan (Group) Ltd 1997 - 2009. All rights reserved.